A stained glass window in the Cathedral of Our Lady in Chartres. The window is the central part of a section depicting the Marriage at Cana. English : A stained glass window in the Cathedral of Our Lady in Chartres. The window is the central part of a section depicting the Marriage at Cana. English : 360 degrees fog bow. A view of the ruins of St Michael's Church, from near the top of Burrow Mump, Somerset. English : A view of the ruins of St Michael's Church, from near the top of Burrow Mump, Somerset. Long-billed Dowitcher (Limnodromus scolopaceus) lifts its bill above the water for a moment while walking and feeding in a shallow, muddy pond. English : Long-billed Dowitcher (Limnodromus scolopaceus) lifts its bill above the water for a moment while walking and feeding in a shallow, muddy pond. Donald Zackary "Zack" Greinke, an American Major League Baseball starting pitcher. English : Donald Zackary "Zack" Greinke, an American Major League Baseball starting pitcher. The spectacular star-forming region known as the Flame Nebula, or NGC 2024, in the constellation of Orion (the Hunter) and its surroundings. The famous Horsehead Nebula is in the lower right part of the image. English : The spectacular star-forming region known as the Flame Nebula, or NGC 2024, in the constellation of Orion (the Hunter) and its surroundings. The famous Horsehead Nebula is in the lower right part of the image. San Sebastián (Basque Country, Spain) seen at night photographed from Monte Urgull. English : San Sebastián (Basque Country, Spain) seen at night photographed from Monte Urgull. A mute swan (Cygnus olor). English : A mute swan (Cygnus olor). Grey Heron (Ardea cinerea) looking for breakfast just after dawn off a beach in South Devon, United Kingdom. English : Grey Heron (Ardea cinerea) looking for breakfast just after dawn off a beach in South Devon, United Kingdom. Three Zlins Z-50LS of the Żelazny Aerobatic Team performing at the Góraszka Air Picnic. English : Three Zlins Z-50LS of the Żelazny Aerobatic Team performing at the Góraszka Air Picnic. Spilomyia sayi, mating couple near Miller Lake, Ontario. English : Spilomyia sayi, mating couple near Miller Lake, Ontario. Water drop creation from a stalactite, inside the Salbert fortifications. English : Water drop creation from a stalactite, inside the Salbert fortifications. Local train on the Bernina Express line between Lagalb and Ospizio Bernina pulled by two ABe 4/4 multiple units (an ABe 4/4 II leading an ABe 4/4 III). The two multiple units have excess power with only two passenger cars, so some freight is carried along. English : Local train on the Bernina Express line between Lagalb and Ospizio Bernina pulled by two ABe 4/4 multiple units (an ABe 4/4 II leading an ABe 4/4 III). The two multiple units have excess power with only two passenger cars, so some freight is carried along. An exhaust cloud engulfs Launch Pad 39A at NASA's Kennedy Space Centre in Florida as space shuttle Endeavour lifts off into the night sky. This was the last shuttle night launch. English : An exhaust cloud engulfs Launch Pad 39A at NASA's Kennedy Space Centre in Florida as space shuttle Endeavour lifts off into the night sky. This was the last shuttle night launch. The pale blue Earth serves as a backdrop for astronaut Michael Gernhardt, who is attached to the Shuttle Endeavour's robot arm during a spacewalk on the STS-69 mission in 1995. English : The pale blue Earth serves as a backdrop for astronaut Michael Gernhardt, who is attached to the Shuttle Endeavour's robot arm during a spacewalk on the STS-69 mission in 1995. Dirce Beauty (Colobura dirce). Taken at Botanischer Garten, Munich, Germany. English : Dirce Beauty (Colobura dirce). Taken at Botanischer Garten, Munich, Germany. Kuna woman selling molas in Panama City. English : Kuna woman selling molas in Panama City. An adult female European Grass Snake (Natrix natrix). English : An adult female European Grass Snake (Natrix natrix). White-breasted Nuthatch (Sitta carolinensis), Cap Tourmente National Wildlife Area, Quebec, Canada. 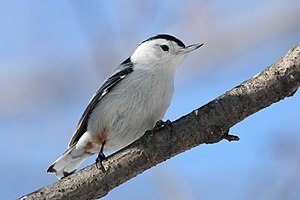 English : White-breasted Nuthatch (Sitta carolinensis), Cap Tourmente National Wildlife Area, Quebec, Canada. Centre of the Ferris wheel near square Masséna in Nice, France, at night, in December 2008. English : Centre of the Ferris wheel near square Masséna in Nice, France, at night, in December 2008.